Under Mussolini’s fascist regime, many Sinti and Roma families were held prisoner in camps. Many of them came from the Yugoslav territories annexed by Italy. 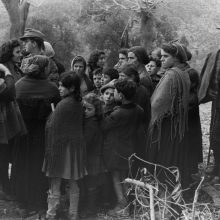 According to witness accounts, Sinti and Roma were also deported from the northern part of Italy occupied by the armed forces to concentration camps in Germany during the latter stages of the war.